The biggest surprise of the winter so far was the discovery today at Brompton-by-Sawdon of a ♂ Ring Ouzel by John Harwood in the paddock opposite the churchyard at 11.30. 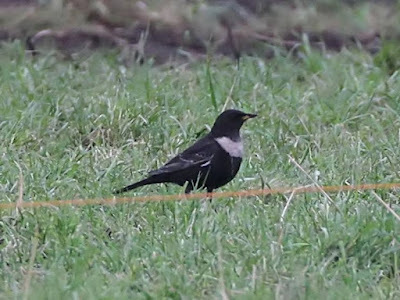 The bird remained in the area for the rest of the day but was often distant and difficult to locate, this is the first winter record for the Scarborough area of this species as it was for many, if not all, of the observers who visited the area this afternoon. 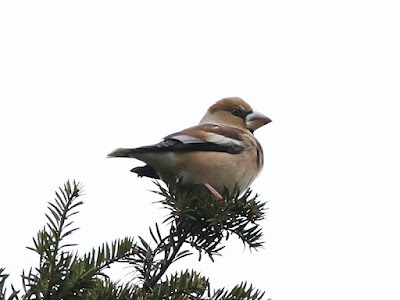 Whilst discussing the Brompton area the Hawfinches were showing frequently again today but as on previous days the views were mostly distant in the trees behind the church and the light was not good for the many who were after photographs. A maximum of 12 birds were seen in the area today, the highest number seen here so far during the current national invasion by this species. Also around Brompton today there was a mixed flock of about 100 Fieldfares and Redwings when the Ouzel was first discovered but they seemed to move on quite quickly and also during the afternoon three Common Buzzards performed gracefully low over the churchyard. At Thornton-le-Dale another Hawfinch was seen in the usual area around Rectory Lane. At Wykeham South Lake a Great White Egret dropped in behind the island at 11.45 and there were also 150+ Wigeon, 2 Goldeneye, a Pochard, a ♀ Shoveler and 6 Great Crested Grebes. Back in Scarborough there were 2 Waxwings briefly in a Stepney Drive garden at 14.40 and in Cornelian Bay 3 Red-throated Divers, a Great Crested Grebe and an Eider then at 12.50 30 White-fronted Geese flew over to the south also a Common Snipe and a Jack Snipe were flushed from the large ploughed field. At Long Nab today the overwintering Whimbrel appeared again on the rocks below the Obs, a Great Skua flew south at 10.13 and an adult Mediterranean Gull also flew south here. At Johnson’s Marsh there were 42 Teal and 3 Wigeon whilst at Scalby Mills there was a ♂ Common Scoter. In the Folkton Carr area today we had 1460 Lapwings, 600 Starlings, a few Golden Plovers and a Stonechat, also briefly 33 White-fronted Geese were seen here before being flushed when they flew in the direction of Flotmanby Carr but could not be relocated in the remaining daylight. Finally today c10 Brambling were with a mixed flock of Linnets and Chaffinches and there were also about 200 Fieldfares in the stubble fields near to Wilton Heights Quarry.